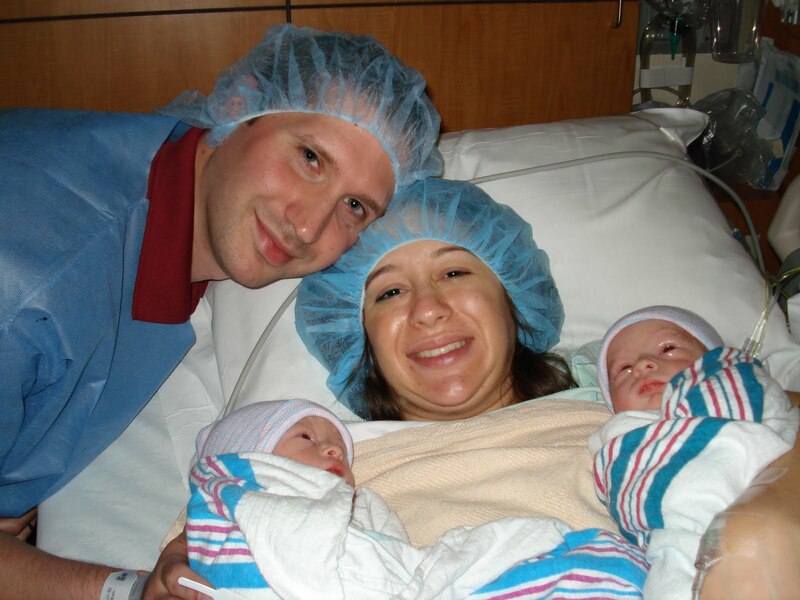 Raising Identical Twin Boys and a "Princess": Birth Story! Well I have been absent from blogger for a couple of weeks, but I have a good excuse! Our twin sons were born August 17th at 1:38am and 1:40am. I had been having contractions during my pregnancy from about 23 weeks on, so I didn't think Too much of it when a few of my contractions were slightly more painful & crampy. They began to feel like this about 2 weeks before I delivered, but I didn't mention it to my doctor. My main concern when going to my 36 week appointment (on August 16th) was discussing not getting my membranes stripped (see my previous post). At my appointment, my OB checked my cervix and asked, "how far along do you think you are?" I told her I didn't know. She let me know I was already 4cm dilated. This meant I was already in labor and "didn'tknow it." (So no need to strip my membranes). She wanted to send me down to L & D right then. I was hesitant, because I didn't feel like my contractions were regular yet. However, my doctor talked me into it.. by saying I shouldn't be laboring long at home with twins. If I came in 8cm dilated in the middle of the night, they would have to hurry to set everything up, etc.. and it wouldn't be as safe for the second twin (who would come out by breech extraction). So.. I shakily told her I would go to L & D. Completely in shock.. I thought I had another week or two left (even though I had made it to 36.6 weeks with twins). My mom had come with me to my appointment, so I let her know what was going on, and we both called our husbands. Then we walked across the street to the hospital. (It was a very anti climactic trip to the hospital I must say.. for actually being in labor). I did end up feeling about 5 really good contractions before I got the epidural. Getting the epidural was probably the worst part of the labor. I lost count of how many times they tried to get the needle in, but it was at least 4 or 5. At one point, I told her to stop trying.. I needed a break. My husband was so wonderful during this part, he let me squeeze his hand really hard, and he didn't tell me how horrible the needle looked, haha. My labor nurse was also really good. Once the epidural was in though, it acted really fast. I can only describe it as if my legs suddently felt "warm and fuzzy". I didn't feel any more contractions after this. About 3 hours after the epidural, I had gone from 5cm to 8-9cm. (I napped during this time.. so I kind of did cheat my way through the labor). My nurse told me to let her know if I felt an urge to push & she would check me again. Well... I was really worried I wouldn't feel the urge since I had an epidural. I kept saying.. I think I may feel Something. She eventually checked me again at around 12:50am, and I was fully dilated. She called the doctor, the anesthetist, the NICU team (they had told me they would be outside the OR as a courtesy), and a few other people while they prepared the OR for the delivery of the twins! I don't know why, but it still didn't feel real to me! The doctor arrived around 1:20am or so, and I was wheeled to the OR & moved to the OR bed. (Alan was with me in his surgical hat, shoes, and outfit). There were tons of people in the room, but I was mainly just focused on my doctor, the labor nurse, and Alan. I had no idea what I was doing when it came to pushing, my my doctor & nurse were really good about instructing me on what to do. I couldn't feel my contractions, so I told them to let me know when to push. I had no trouble actually pushing though once I got the technique down. I pushed through about 5 contractions, and pushed out our little Adam! It was a strange sensation giving birth to a baby.. and I still yelled as he came out even though I had the epidural. My first thought when he came out was that he was too tiny to be 6 lbs. (He ended up being just 5lbs 0ozs.) Alan cut the umbilical cord, and that sent blood spraying around the OR.. sone even landed on my eyelid, so I have blood on my face in some of the OR pictures... haha. Matthew's birth was a little less straight forward. He was breech and my doctor reached in & grabbed his feet & pulled him out. I started to push, but my doctor told me not to do anything.. to just relax (that's why I needed the epidural). According to Alan, she pulled, turned, pulled, and turned the baby until everything was out but his head. Then she called in the NICU team, while the head was still inside. That scared me because I wasn't sure if something was seriously wrong with getting the baby out. She used piper forceps to get the head out, and kind of flipped the baby out onto my stomach. He was born 2 minutes after Adam, but it was the longest 2 minutes of my life! The baby was blue, so the NICU team gave him some blow by oxygen & he was fine. Awww, I loved reading your birth story! I'm so happy for you, and the boys are precious! Finally I discover this! Even though I was waiting while all this was going on, I hadn't had the whole story before. When the two granpa's started taking pictures of the most beautiful sight ever -- my daughter lying in the hospital bed holding two little bundles, her husband behind her -- the people pushing the bed called them the "Paparazzi". You are an amazing mama, Krystal. We are so pleased with out little twin grandsons, and so proud or you and Alan. I'm 34 weeks 5 days with identical twin girls, and my delivery is scheduled for August 30th...12 days from today. I'll be b/w 36 and 37 weeks. I am excited to find your blog and to read about your birth story. Thanks for posting! I look forward to reading more.